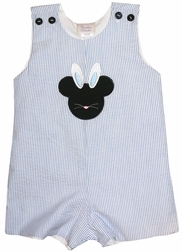 Finally, we are revealing our simple yet cute boy's Disney, Mickey Mouse Easter bunny John John or shorts outfit. The John John is made in one of our favorite summer fabrics-light blue stripe seersucker. The shorts set is comprised of a white, soft cotton shirt and light blue seersucker shorts. 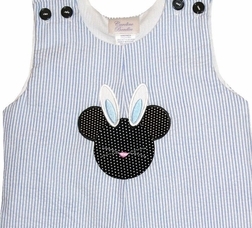 Both the front of the John John and the front of the shirt are appliqued with Mickey Mouse dressed in bunny ears and a little pert pink bunny nose and whiskers. The ears are white and blue on the inside. You can choose to have Mickey's head made with solid black fabric or black with little white polka dots. Black buttons are used to fasten the shoulder straps.